The Recessed Chamber Filter Press (RCF Press) is recognized as the most efficient method of liquid/solid separation by pressure filtration. Its performance is far beyond the capabilities of other liquid/solids separation devices for dewatering and filtration. The RCF Press produces low TSS filtrate filter cakes of 20 to 85 percent solids, depending on the product. For the process industry, the RCF Press uses lower wash volumes with more uniformity than other types of equipment to wash filter cakes more efficiently. By simply changing the filter cloths or plates, the RCF Press readily adapts to changes in product and process applications. Because the RCF Press processes such great operational flexibility, it can be the solution to several problems and/or processing requirements by simply making minor changes. The RCF Press hydraulic closing system is pneumatically operated, with no electrical components. Minimal volumes of in-plant compressed air are required for operation, adding to the outstanding energy saving and safety benefits of the RCF Press. Optional motor driven hydraulic systems are available. Unanticipated expansion of the RCF Press is easily accomplished by installing longer side bars and adding filter plates. 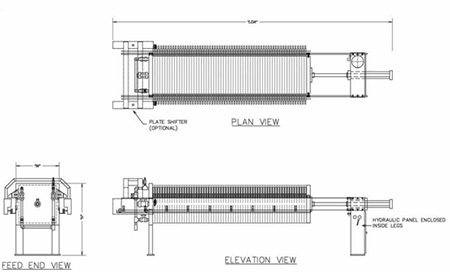 For anticipated future expansion, the RCF Press can be supplied with extended sidebars and a removable expansion piece. The RCF Press, when used for solution filtration in the filtration mode, is constructed to easily and uniformly precoat the filtration surface, therefore providing high throughput, long filter runs and superior filtrate clarity. Aries equipment engineers can custom design and manufacture a filtration system for your individual need and application. Particles under pressure are uniformly deposited on the surface of the filter cloth. This initial build-up becomes the filtering media. This clear filtrate passes through the cloth and is channeled to the discharge ports. The discharge will stop when the chambers fill with solids and the feed pump is the turned off. To remove any excess liquid remaining in the press, air blowdown is used. To accomplish this, air is blown into the center feed line directly as the line enters the head plate. This will dewater the centers of each plate and force most of the free water out of the discharge eyes. For required product washing, the washing agent may be introduced in two separate ways. It may be pumped in through a discharge port as a backwash, or through the centerfeed inlet as a follow-through wash after initial dewatering. Upon wash completion, a short air blowdown is used to remove any excess washing agent. At this point the press is opened by turning the sidebar switch to the “open” position and sliding the lightweight plates apart, allowing dewatered cake to fall from the chamber recesses. The press can be back in operation within a minimal amount of time. Hand cranking or pumping to close the press is eliminated by a pneumatically actuated hydraulic pump. Varying temperatures and pressures that can expand or contract the polypropylene filter plate stack are automatically compensated for by the hydraulic pump. The center feed air blowdown is simple and effective. It doesn’t require four discharge eye valves and a procedure. The standard press is equipped with an air inlet valve on the press feed inlet. 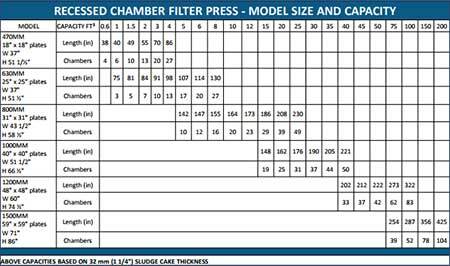 The plates for the RCF Press include gasketed or non-gasketed chamber plates, membrane chamber plates, plates and frames. These plates are lightweight, easy to handle and clean. Other types of porting are also available. Accepted as superior material by industry worldwide, polypropylene plates are lightweight corrosion resistant and provide long service life. Cost effective processing and handling are an added benefit of RCF Press plates as they provide effective filtration and liquid/solid separation, and produce low moisture filter cake. A time and labor saving option, the air-powered plate shifter eliminates manual separation of the plates, simplifying the removal of filter cakes fro the press. A push button switch with a deadman safety switch controls the plate shifter. The shifter will stop moving plates and return to the non-function position if the operator fails to maintain pressure on the control button. For maximum protection, all operating components are mounted in an enclosed housing. By using a longer skeleton and removable expansion piece, future additional capacity can be constructed for the RCF Press. Because the expansion piece is used to occupy the space required for future plates, skeleton changes in the field are eliminated. Basically, the expansion piece is a tubular extension which fits onto the hydraulic cylinder and attaches to the traveling tailpiece with a high strength universal joint. To determine the feasibility of using the RCF Press for your process or application, Aries Equipment will run a sample analysis in our lab. Aries has 250 mm test presses available for field test work. Initial testing determines cloth type, plate style, chemical additives, operating pressure, and process time, assuming proper sizing of a RCF Press for your needs. Upon testing completion, you will be sent a lab report accompanied by an actual filtrate and cake sample which will demonstrate what a Recessed Chamber Filter Press can do for you.